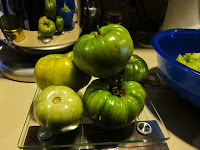 Last week at the farm share they said you could take as many green heirloom tomatoes as you could use, so I threw some in my bag and thought about relishes. I had 7+ pounds and decided to make a chutney and piccalilli. It took a few days for me to get organized and have some time, but today was a good day for this. First I started on the veggies for the piccalilli. 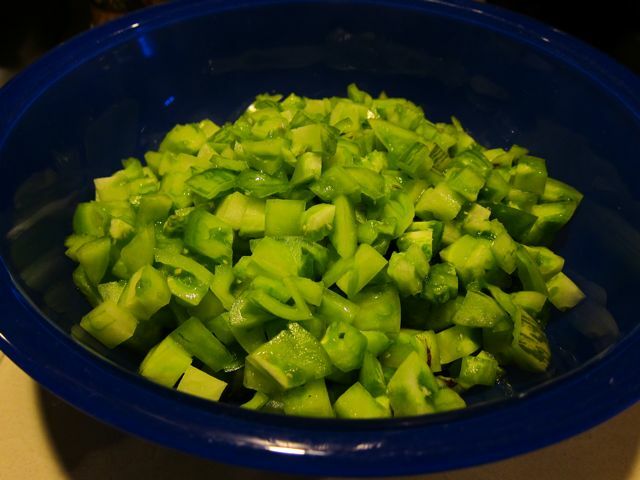 I chopped 2 quarts of green tomatoes, 2 red peppers, 2 green peppers, a nd 2 large onions and mixed them with 1/4 c. of Kosher salt. This was covered and left on the counter. Then we went apple picking. Today was going to be the absolute last day for our favorite farm, so I figured we'd better go and go early. We arrived just 5 minutes after they opened to a parking lot full of cars. Even with that, the orchards weren't too crowded and we were able to get a half bushel of Empires, Golden Delicious, Cameos and Cortlands pretty quickly. Boil the brine. 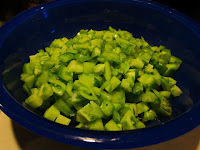 Put the sliced peppers in jars and pour the brine over the top, leaving a 1/2-inch headspace. Process in boiling water bath for 10 minutes. While that was processing, I started this Green Tomato Chutney. This was boiled down for an hour and packed into 4 half-pint jars. The recipe claims to make 3 pints, but I only got 2. The chutney was processed for 15 minutes. Finally, I drained the veggies for the piccalilli and got them boiling in 3 cups of vinegar and water solution (1 to 1), 2 c. of brown sugar, and 1 tsp. each of turmeric, dry mustard powder, and celery seed. This recipe claimed to make 6 pints, I only got 5. This was processed for 5 minutes. I tasted the small amount left in the pot and it is excellent. I still have almost 2.5 lbs. of green tomatoes left. Any suggestions? The dilled green tomatoes were pretty good. I'd have added something spicy though. And a girlfriend made bread and butter pickles with hers. I haven't tried them yet, but she likes them.